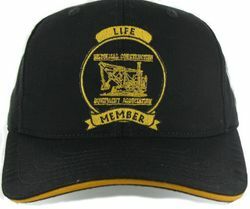 Buy a Life Membership in the HCEA and receive a Life Membership Hat! Life means just that - no more renewal notices, no more dues to be paid ever, and you'll receive each and every future issue of EQUIPMENT ECHOES. You'll also have the satisfaction of knowing that your generosity and commitment will go a long ways towards funding the fulfillment of our mission to preserve the history of the vintage machinery you love. Please consider a Life Membership. Payment can be made in a lump sum or an endowment of five annual $200 payments.